Audi Q7 e-tron 3.0 TDI - a pioneer! Is the Q7 the success Audi hoped for? Can I replace my own Audi Q7 windscreen? How can I save on the cost of a new windscreen? The Audi Q7 is a milestone of the German luxury car manufacturer. It is Audi's first SUV - and the Audi Q7 e-tron 3.0 TDI is an absolute first. The fact that the Q7 is also a luxury model does not mean that the windscreen replacement of your Audi Q7 should immediately cost a lot. By choosing after market automotive glass you can save a lot of money. But before we look at this, we first compare the two generations of the Q7. How did the Audi Q7 perform, and how successful is that first Audi SUV anyway? In 2005 Audi showed a new model in Frankfurt and it immediately got the attention of the media. 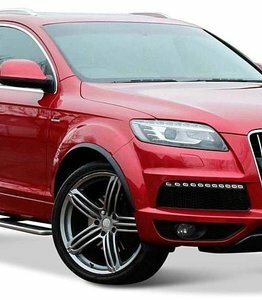 Audi had decided to make an SUV as well and the new Q7 had to take over the market. The first generation of this model was quite remarkable. A relatively wide car with the possibility to fit a third row, different assistance systems and above all a lot of comfort - as we are of course used to from Audi. also started quickly. A real beast, because the V12 engine (6-litre) has a power of 500 hp. In concrete terms this means that this engine gets the cumbersome and heavy Audi to 100 km/h within six seconds. Strangely enough, this was an immediate disadvantage at the time of launch. The Audi Q7 had the worst start possible. First of all because Audi had fallen a long way behind the competition, which had been making SUVs for years. Secondly because this monster was put on the market when there was a lot of criticism on inefficient and large cars. And that is exactly what the first generation of the Q7 is. That is why Audi had to intervene quickly. Not only in Europe was there a lot of criticism, but also on the American market Audi couldn't get a grip on the Q7, while that was one of the reasons why Audi started on the SUV line. The Audi builders sat down at the table and came up with a second generation. njection to make it suitable for the American market and to respond to the criticism. This resulted in a fuel saving of up to 28%. And not only that: the CO2 emissions of this model are so low (46 grams per kilometre) that it has an A-label in the Netherlands and therefore gets more ground in America. Audi decided to take a look on the shelves and brought the characteristic grill of the Audi Q3 to the second generation of the Q7. And of course this Audi can also be fully complemented with various packages, such as extra assistance systems, rims up to 22 inches and a plug-in hybrid engine. The Audi Q7 e-tron 3.0 TDI version has been a first in the automotive industry. Audi has developed the very first plug-in hybrid with a diesel engine and four-wheel drive. At the time of launch it had one of the longest ranges compared to other hybrids. But it wasn't a huge success. The total weight of this car doesn't even touch the 2,500 kilos, making it a bulky monster. Especially because the focus is on fuel saving, which is not really part of Audi's image. It is also not possible to quickly recharge the car, which is a big mistake at the moment. Nevertheless, the Audi Q7 e-tron 3.0 TDI version remains the first in its class. Audi entered the SUV market at the wrong time with the wrong model. And that's a good thing. The German car manufacturer immediately went back to the drawing board to make adjustments, paying particular attention to economy and an environmentally friendly character. The Q7 will shine especially from 2015, the moment when the second generation was offered - and at the time of writing (2019) this is still being built. In terms of sales figures, the Q7 with 5000 copies in the Netherlands scores below expectations. But the e-tron models of the Q7 have been the forerunner of the e-tron models with which Audi wants to take over the market from 2020. All in all, the Q7 is certainly a model that will be allowed to go down in the history books. The advantage of Audi is that there are always enough spare parts available. There is a big after market. And you can also use it when the car window replacement is needed. But when does a car window have to be replaced? A crack in the windscreen is not a pretty sight when you are proud of your Audi Q7. When the crack is in the driver's field of vision, it is particularly dangerous to continue driving with it. Unpredictable reflections of light from the window damage can cause glare and misjudgement while driving. The only option then is a windscreen replacement. Only when you have a lot of experience with windscreen replacement and when you have all the tools, you can replace the Audi Q7 windscreen yourself. You can then order a windscreen without installation. In all other cases it is better to leave the replacement of the windscreen of your Audi Q7 to our certified partners. You will then receive a guarantee on the work and you will not have to worry about it. Saving on the cost of a new windscreen for your Audi Q7 is easy. You choose after market automotive glass. This vehicle glass meets exactly the same requirements as the brand glass from your dealer. The only thing missing is the logo, which reduces the cost of a new windscreen. After market automotive glass is often made in the same factories as the brand glass. Should the windscreen of your Audi Q7 be replaced? On our website you will find attractively priced after market car windows for your Audi. Do you have any questions or can't figure it out? Just contact us, we will be happy to help you.